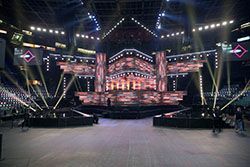 The JUNO Awards, Canada’s most prestigious music awards show, recently aired live on CTV from Calgary’s Scotiabank Saddledome with the L-Acoustics K1/K2 sound system provided by Solotech. Featured show performances included Alessia Cara, Bryan Adams, Buffy Sainte-Marie, Dean Brody, Jann Arden, Shawn Mendes, The Tenors and The Weeknd. JUNO Awards at Calgary’s Scotiabank Saddledome. Solotech’s L-Acoustics system proved to be a particularly ideal solution for Scotiabank Saddledome, which is a beautiful sounding hall with a unique hyperbolic paraboloid-shaped roof (the world’s longest) offering fantastic interior sightlines. That same design, however, poses a number of challenges in terms of weight limitations. Thankfully, the superior weight-to-power ratio of L-Acoustics’ K2 allowed the JUNOs to enjoy powerful system performance without concern for any weight-loading issues. The system that Solotech designed and flew at Scotiabank Saddledome more than sufficiently accommodated the show’s wide range of musical performances—from rock, pop and electronic to country, folk and classical. The main PA consisted of four K1 enclosures over 14 K2 per side, with low frequencies extended by eight K1-SB subs flown to the outside of each K1/K2 hang plus six total SB28 ground-stacked below. Out-fills were comprised of 16 K2 per side, while two more arrays of six K2 were flown out in the house for delay. Six floor-stacked SB28 subs were deployed for the range of music genres represented at the show; Lavorie said the six are a testament to both the SB28’s power and K2’s full-range speaker design. “The amount of sound and low-frequency response that we achieved using only six subs on the floor was amazing,” he says. “And K2, of course, gave us excellent coverage, with a tight pattern that was able to deliver sound exactly where it was needed, in a venue with considerable weight-loading restrictions. The show had a lot of great sound from a system smaller and lighter than you would have expected.